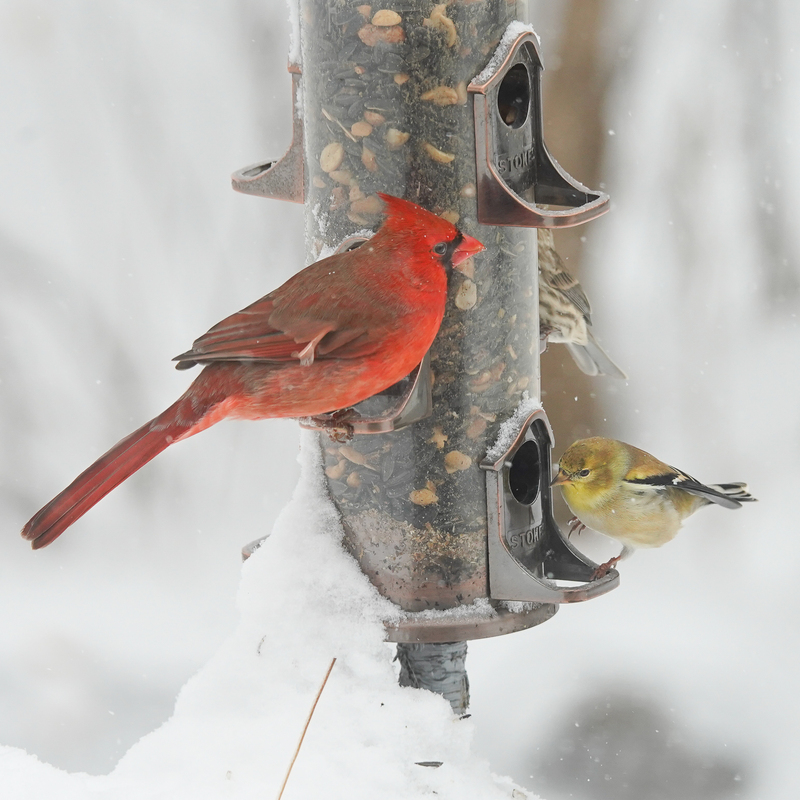 I’ve noticed that the frenzied feeding activity at bird feeders (see yesterday’s post on “finch feeding frenzy“) usually coincides with a precipitous drop in temperature the next day, but I’ve wondered what enables birds to predict that occurrence. Sure enough, the day after I photographed the finch feeding frenzy, the overnight temperature dropped from 20 F above zero to -10 F below. Moderate winds added to the chill making the effective temperature for us humans about -30 F! No birds visited this feeder the next morning until later in the afternoon when the sun had warmed the air up to just about zero degrees F.
Cardinals, Blue Jays, Nuthatches, Chickadees, Slate-colored Juncos, House Finches, and Goldfinches all made an appearance at the bird feeder during the morning hours the day before the frigid temperature drop. Mr. Cardinal didn’t stay long — the finch mob must have scared him off. Nuthatches zoom into the feeder, pick out a peanut treat, and zoom off, while the finches just sit and gobble up sunflower seeds. But it’s not the temperature drop the birds are predicting, it’s the drop in barometric pressure. Low barometric pressure in one area means there will be air movement from a higher pressure area, and in the winter, that usually means Minnesota will receive a big blast of frigid Canadian air. And the data bear this out: barometric pressure reached a low point at noon on the day of frenzied finch feeding and increased almost 30 mm by midnight the next day, bringing with it bright sunny weather but a 30 degree drop in air temperature. It seems that birds are the only land vertebrates (with a couple of exceptions) that possess a paratympanic (i.e., next to the ear drum in the middle ear) barometric sense organ, and it is derived from the same hair cells in sharks and their relatives that provide those fish with information about their jaw movement relative to the prey they intend to gobble up. 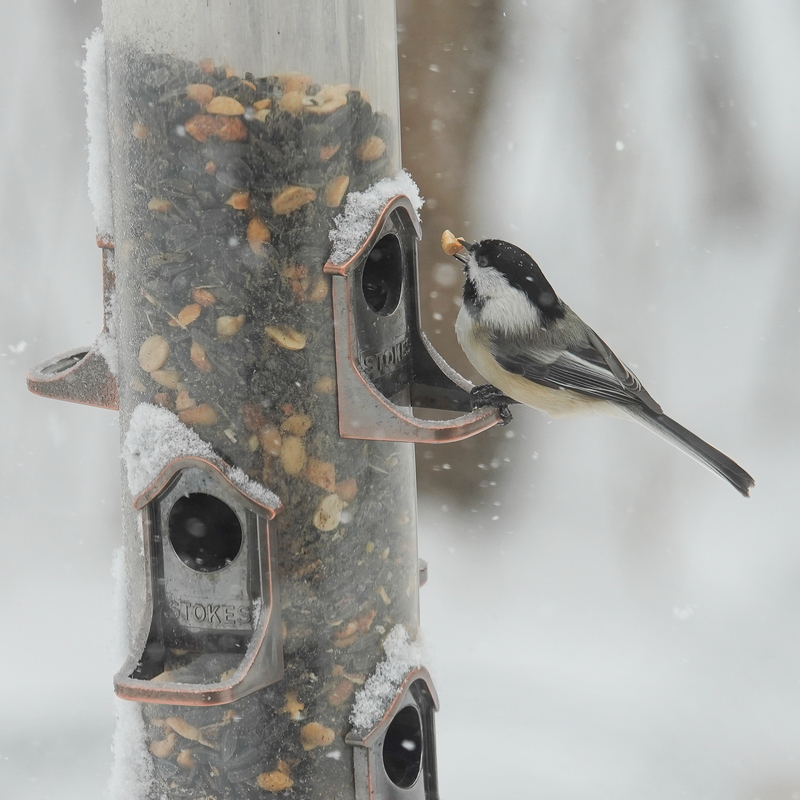 Chickadees and Nuthatches go for the high energy peanut treats in preparation for a blast of cold weather. So, is a 30 mm change in barometric pressure (a little over 1 inch) enough to trigger such a feeding response in my backyard finches? Yes, it is. Experimental data on White-throated Sparrows showed that they could detect a pressure change of as little as 10 mm: when barometric pressure was decreased artificially in a chamber holding migratory sparrows, they immediately began feeding when the lights were turned on; when the pressure was higher (and normal), they became active, preening and hopping around in the chamber, but not feeding. And why is it just the birds that have evolved this magnificently sensitive sensor? In addition to predicting weather fronts, the barometric sensor is most useful for maintaining level flight at a particular altitude during migration. What about mammals, especially humans? Can we detect changes in barometric pressure? 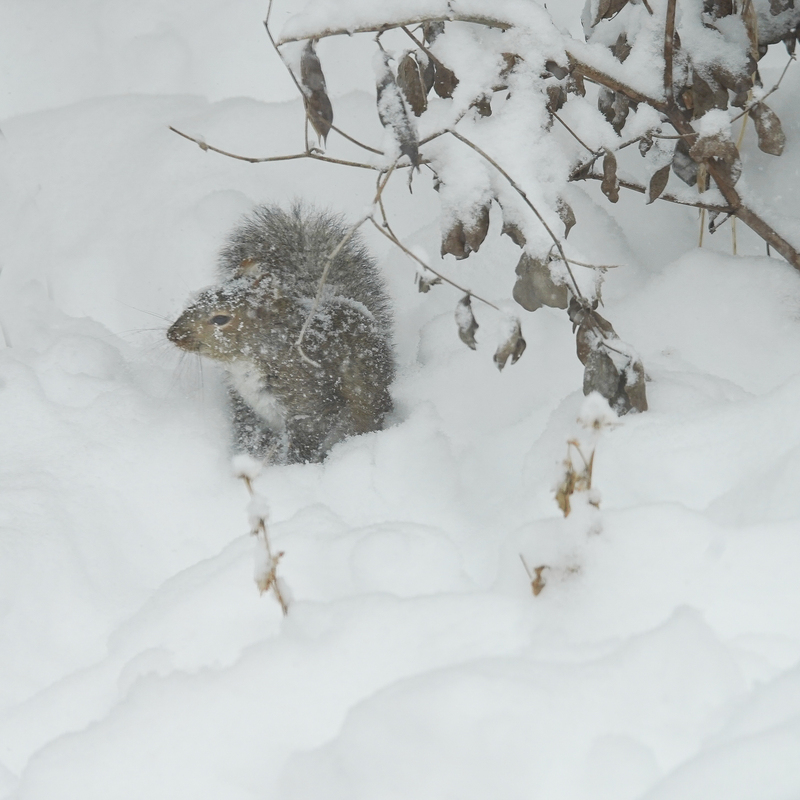 Gray Squirrels were out in numbers looking for seed scattered in the snow by the finch mob. Did they know what was coming the next day? Only one species of bat possesses a physical sense organ that detects barometric pressure, but mammals, including humans, can sense changes in pressure in their ears, sinuses, sometimes joints, but there is no specific receptor for the sensation. Rather it is changes in pressure within a confined cavity that elicits the sensation, and not in everyone. I can usually tell what sort of weather conditions are coming using my “bird barometer”, which consists primarily of monitoring the intensity with which birds are feeding at the various feeders scattered around the backyard. About 24 hours before a big thunderstorm or a dreary day with steady rainfall, those feeders are humming with activities of multiple individuals of a variety of species. For example, yesterday was cloudy but mild, but dozens of finches, sparrows, and chickadees crowded in or around the feeders for several hours in the morning. A flock of a dozen or so White-throated Sparrows searched through the grass and leaves beneath the feeders, often chasing each other away from hot spots where the seed had dropped from the feeders above. Mixed in with the Sparrows were a bunch of Juncos, equally intolerant of others foraging near them. Extended chases of a bird that encroached on another’s foraging space was common. A newcomer to the backyard showed up — a Fox Sparrow. I’ve seen these birds only rarely, and usually just a brief glimpse as they migrate through MN on their way to their breeding grounds in Alaska or their wintering grounds in the southeastern U.S. They scratch through the litter beneath dense cover, making them tough to spot. Fox Sparrows are larger than most other sparrows, with bold breast stripes, a gray stripe above the eye, and rusty red tails and backs. The western US subspecies are slate gray though. 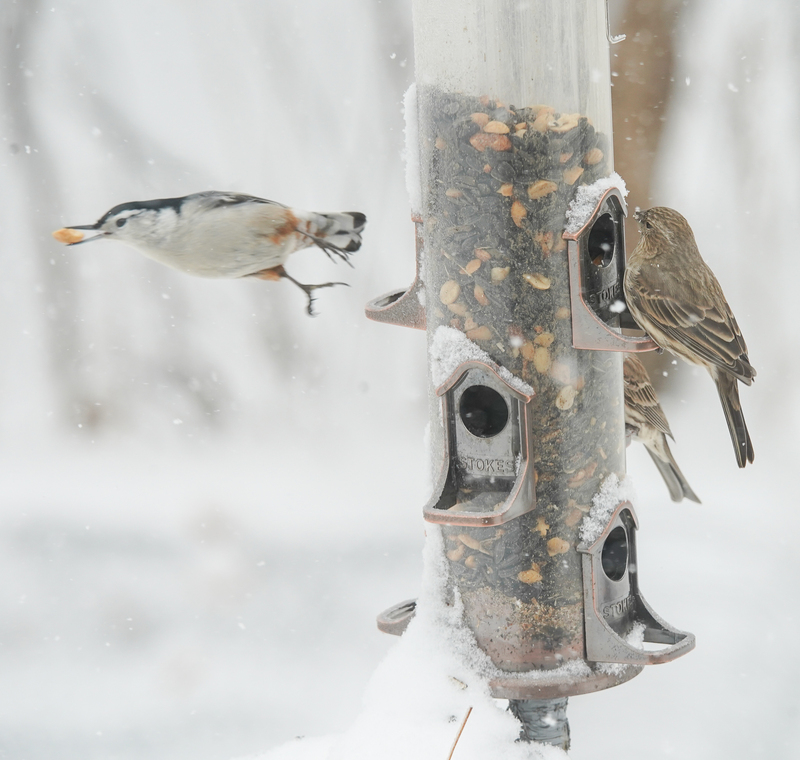 These ground-feeding birds were reaping the benefits of all the spilled seed from the multiple gangs of finches, chickadees and nuthatches vigorously attacking the feeder above them. Red splashes of color on the male House Finch and yellow splashes of color on the heads of the Goldfinches — the last remnants of their colorful selves from the past breeding season. 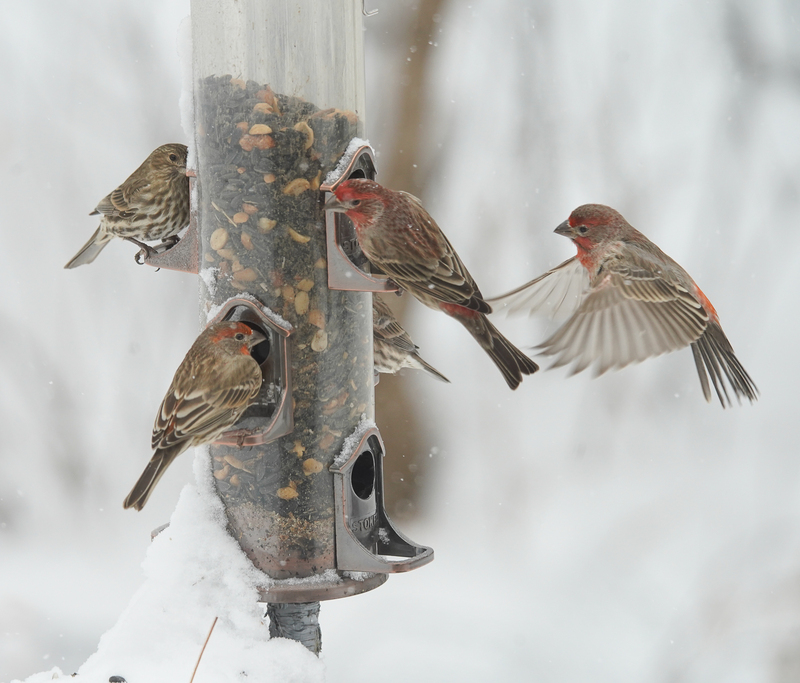 Purple Finches (male on lower right, female on lower left) dominate the feeder to the exclusion of the slightly smaller Goldfinches and Chickadees. Today (just 24 hours after the feeding frenzy) is rainy and cold, and the feeders are quiet. An occasional Blue Jay visits, but even the Chickadees are absent. How do birds predict such changes in the weather? Do they really have an internal barometer? In fact, they do. A group of hair cells in the Vitali Organ, or Paratympanic Organ (named for Giovanni Vitali who discovered them about 100 years ago) in the middle ears of birds is thought to be responsible for detecting changes in atmospheric pressure of just 10-20 mm of water (about 0.75-1.5 mm of mercury). Such exquisite sensitivity allows birds to maintain their elevation while flying long distances within 10-20 feet of desired altitude — essential for navigation, but it also allows birds to sense changes in barometric pressure at ground level, especially the declining barometric pressures that signal approaching storm fronts. Input from these specialized cells due to barometric pressure changes then causes abrupt and marked changes in bird behavior, as they prepare for and protect themselves from changes in the weather. Are birds the only animals with this unique ability? Hardly. Most animals can sense impending changes in the weather, using a variety of other cues (infrasound, daylight, smell (ozone? ), static electricity, etc.). But only one group of mammals may possess the type of middle ear barometric pressure detectors present in birds. Can you guess what group that might be? An interesting reference on this subject can be found here: Von Bertheld and Gianessi, 2011. The Paratympanic Organ: A barometer and altimeter in the middle ear of birds? Journal of Experimental Zoology 316 (6): 402-408.